John Paton gave a talk at the Global Editors Network News Summit in Paris on June 21. It was titled, “When Theory Meets Numbers Meets Media: R = ([(P*Q)+P] + [(D*G)+D] + C – E) * (P+D+C).” You’ll find out what that formula is if you read the copy of the speech posted on his website. And finally there can be no risk without reward. Smart, risk-taking legacy news organizations will successfully transform. And that wealth has to be shared for the employees who are taking those risks with the Company. To that end, Digital First Media will roll out in the coming weeks the details of a profit sharing plan for all employees. It will include non-union and union employees’ alike but not senior executives. They’re well paid and it’s enough already. It says that $1 of operating profit will turn into $0.56 of loss in 5 years. That’s what no risk taking will get us. 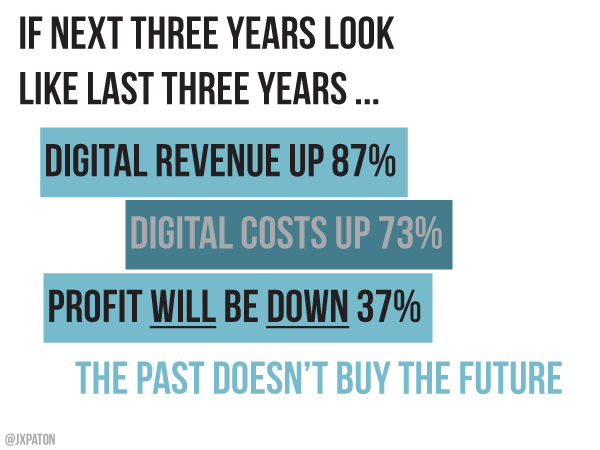 Over the next three years if our digital revenue goes up again around 87% and digital costs go up again about 73% – mobile, video, digital sales and content don’t come free – then profit will be down 37%. Not up but down. 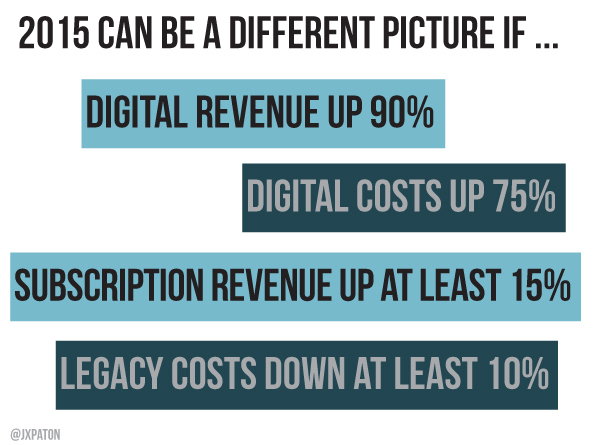 We can no longer treat digital as a bolt-on to our strategy and protect the legacy business. There are also some opportunities to drive subscription revenue – not pay walls only, they remain a stack of digital pennies – but there is some short-term gain in the so-called All Access strategy of bundling print subscriptions with digital subscriptions. All Access is nothing like a solution for our industry but it could buy some gas in the tank to get down the road. It is currently the rage in our industry because it doesn’t require you to think too much about the digital future you have to build – just what you might be able to charge your print customers today for it. But that said, if all of those levers are pulled at our company – instead of profit down about 40% in three years. It would be up another 40%. We finished 2012 with about $164M in digital ad revenue – about 17% of that revenue was from mobile, video, SEO and programmatic. Our plans call for us to more than double that $164M in the next three years. But by 2015, those same categories will represent more than half of our digital ad revenue. Banner advertising will only be about 15%. The road to the future can be built. But it cannot be built on models from the past. You have to hold your editors, news executives, sales leaders and most of all your CEOs to account. You have to demand their efforts are focused on building the future. Think of it as your own personal Occupy moment. Demand change of your bosses. If you don’t see the kinds of investments I am talking about in your company. And if you don’t see the kinds of tough decisions to cut expenses in what is not growing –print – and increased spending in what is growing – digital – then get out because your company is surely dying. Check out the whole speech — it’s worth reading. The slides are from the presentation.